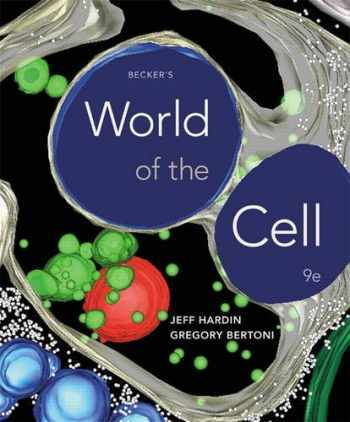 Acknowledged author Jeff Hardin wrote Becker's World of the Cell (9th Edition) comprising 920 pages back in 2015. Textbook and etextbook are published under ISBN 032193492X and 9780321934925. Since then Becker's World of the Cell (9th Edition) textbook received total rating of 4 stars and was available to sell back to BooksRun online for the top buyback price of $60.20 or rent at the marketplace. For courses in cell biology. Explore the world of the cell Widely praised for its strong biochemistry coverage and clear, easy-to-follow explanations and figures, Becker’s World of the Cell provides a beautifully-illustrated, up-to-date introduction to cell biology concepts, processes, and applications. Informed by many years of classroom experience in the sophomore-level cell biology course, the dramatically-revised 9th Edition introduces molecular genetics concepts earlier in the text and includes more extensive coverage of key techniques in each chapter. Becker’s World of the Cell provides accessible and authoritative descriptions of all major principles, as well as unique scientific insights into visualization and applications of cell and molecular biology. Also available with Mastering Biology This title is available with Mastering™ Biology—an online homework, tutorial, and assessment program designed to work with this text to engage students and improve results. Within its structured environment, students practice what they learn, test their understanding, and pursue a personalized study plan that helps them better absorb course material and understand difficult concepts. Note: You are purchasing a standalone product; Mastering Biology does not come packaged with this content. Mastering Biology is not a self-paced technology and should only be purchased when required by an instructor. Students, if interested in purchasing this title with Mastering Biology, ask your instructor for the correct package ISBN and Course ID. Instructors, contact your Pearson representative for more information. If you would like to purchase both the physical text and Mastering Biology, search for: 0321934784 / 9780321934789 Becker's World of the Cell Plus Mastering Biology with eText -- Access Card Package Package consists of: 032193492X / 9780321934925 Becker's World of the Cell 0134157257 / 9780134157252 Mastering Biology with Pearson eText -- ValuePack Access Card -- for Becker's World of the Cell Becker’s World of the Cell, 9th Edition is also available via Pearson eText, a simple-to-use, mobile, personalized reading experience that lets instructors connect with and motivate students — right in their eTextbook. Learn more.